A day after the arrest of an MP of her party in connection with the Saradah scam, West Bengal Chief Minister Mamata Banerjee launched a blistering attack against the Modi government, accusing it of "selective vendetta" against her and the party and dared the Centre to impose President's rule and arrest her. "Amake jail-e pathak, dekhe nebo (Let them send me to jail, I will see to it. I will see how big a jail is there,” Banerjee said addressing a party meeting in Kolkata attended by MPs, ministers and MLAs. "If we are hit, we will retaliate. We accept all challenges," Banerjee, chief of the Trinamool Congress, said. She told party workers not to 'fear the BJP', asking them to unite against the conspiracies of the saffron party. Daring the Centre to impose President's rule in the state, she said, "I challenge them to impose President's rule. We will reply through ballots. We are not slaves of power. We only work for people. We will organise protest against selective vendetta against us." "They want to silence all voices of dissent. Even Sonia Gandhi is not opening out. 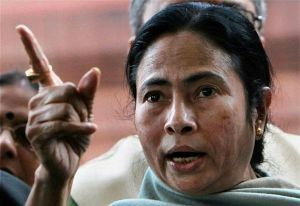 They are afraid of me, hence they are engaging in conspiracies," Banerjee said. "Our fight against political vendetta has started. They have attacked us, we will reply politically," she said with several thousands of party workers from different districts assembled at the Netaji Indoor Stadium and even outside. Referring to the arrest of her party MP Srinjay Bose on Friday, she claimed that the BJP was actually targeting her because she attended a Congress-organised event in Delhi recently to mark Jawaharlal Nehru's 125 birth anniversary. "Just because I went to Delhi to attend a conclave of secular parties, they took revenge by arresting our MP," Banerjee said adding "I take up this challenge and I will attend such programmes for secularism a hundred and thousand times". "I do not need character certificate from the BJP," she said. "I do not need any certificate of my credentials from them. My credentials are known to the people of Bengal," she said, wondering "Why anyone did not question the BJP about how they spent crores of rupees in elections". "Those who have several cases of rioting against them, how can they point fingers at us? They want to finish secularism. They want to finish regional parties," she said targeting the BJP-led government at the Centre.